The San Andreas Fault is a continental transform fault that runs a length of roughly 810 miles (1,300 km) through California in the United States. The fault’s motion is right-lateral strike-slip (horizontal motion). It forms the tectonic boundary between the Pacific Plate and the North American Plate. The fault was first identified in Northern California by the UC Berkeley geology professor Andrew Lawson in 1895 and named by him after a small lake which lies in a linear valley formed by the fault just south of San Francisco, the Laguna de San Andreas. After the 1906 San Francisco Earthquake, Lawson also discovered that the San Andreas Fault stretched southward into southern California. Large-scale (hundreds of miles) lateral movement along the fault was first proposed in a 1953 paper by geologists Mason Hill and Thomas Dibblee. Located at the Highway 138 and Interstate 15 junction, the Mormon Rocks are visual evidence of the San Andreas fault lying beneath the California surface. 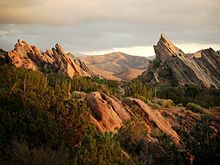 Vasquez Rocks in Agua Dulce, California are evidence of the San Andreas Fault line and part of the 2,650 mile Pacific Crest Trail. Research has shown that the Southern segment, which stretches from Parkfield in Monterey County, California all the way down to the Salton Sea, is capable of a Richter scale 8.1 magnitude earthquake. An earthquake of that size on the Southern segment (which, at its closest, is about 35 miles away from Los Angeles) would kill thousands of people in Los Angeles, San Bernandino, Riverside, and other areas, and cause hundreds of billions of dollars in property and economic damage. The evolution of the San Andreas dates back to the mid Cenozoic, to about 30 Mya (million years ago). 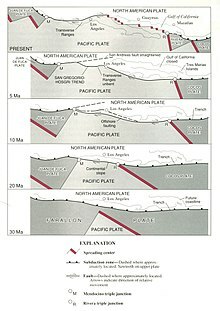 At this time, a spreading center between the Pacific Plate and the Farallon Plate (which is now mostly subducted, with remnants including the Juan de Fuca Plate, Rivera Plate, Cocos Plate, and the Nazca Plate) was beginning to interact with the subduction zone off the western coast of North America. The relative motion between the Pacific and North American Plates was different from the relative motion between the Farallon and North American Plates, so when the spreading ridge was “subducted”, a new relative motion caused a new style of deformation. This style is chiefly the San Andreas Fault, but also includes a possible driver for the deformation of the Basin and Range, separation of Baja California, and rotation of the Transverse Range. The westward component of the motion of the North American Plate creates compressional forces which are expressed as uplift in the Coast Ranges. Likewise, the northwest motion of the Pacific Plate creates significant compressional forces where the North American Plate stands in its way, creating the Transverse Ranges in Southern California, and to a lesser, but still significant, extent the Santa Cruz Mountains, site of the Loma Prieta Earthquake of 1989. Studies of the relative motions of the Pacific and North American plates have shown that only about 75 percent of the motion can be accounted for in the movements of the San Andreas and its various branch faults. The rest of the motion has been found in an area east of the Sierra Nevada mountains called the Walker Lane or Eastern California Shear Zone. The reason for this is not as yet clear, although several hypotheses have been offered and research is ongoing. One hypothesis which gained some currency following the Landers Earthquake in 1992 is that the plate boundary may be shifting eastward, away from the San Andreas to the Walker Lane. Assuming the plate boundary does not change as hypothesized, projected motion indicates that the landmass west of the San Andreas Fault, including Los Angeles, will eventually slide past San Francisco, then continue northwestward toward the Aleutian Trench, over a period of perhaps twenty million years. Radar generated 3-D view of the San Andreas Fault, at Crystal Springs Reservoir near San Mateo, California. 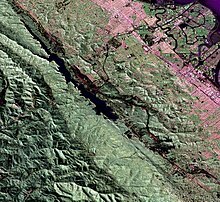 In central California is the small town of Parkfield, California, which lies along the San Andreas Fault. Seismologists discovered that this section of the fault consistently produces magnitude 6.0 earthquakes about every 22 years. Following earthquakes in 1857, 1881, 1901, 1922, 1934, and 1966, scientists predicted an earthquake to hit Parkfield in 1993. This quake eventually struck in 2004 (see Parkfield earthquake). Because of this frequent activity and prediction, Parkfield has become one of the most popular spots in the world to try to record large earthquakes. In 2004, work began just north of Parkfield on the San Andreas Fault Observatory at Depth (SAFOD). The goal of SAFOD is to drill a hole nearly 2 miles (3.2 km) into the Earth’s crust and into the San Andreas Fault. An array of sensors will be installed to record earthquakes that happen near this area. A study completed by Yuri Fialko in 2006 has demonstrated that the San Andreas fault has been stressed to a level sufficient for the next “big one,” as it is commonly called; that is, an earthquake of magnitude 7.0 or greater. The study also concluded that the risk of a large earthquake may be increasing more rapidly than researchers had previously believed. Fialko also emphasized in his study that, while the San Andreas Fault had experienced massive earthquakes in 1857 at its central section and in 1906 at its northern segment (the 1906 San Francisco earthquake), the southern section of the fault has not seen a similar rupture in at least 300 years. If such an earthquake were to occur, Fialko’s study stated, it would result in substantial damage to Palm Springs and a number of other cities in San Bernardino, Riverside and Imperial counties in California, and Mexicali municipality in Baja California. Such an event would be felt throughout much of Southern California, including densely populated areas of metropolitan San Bernardino, Los Angeles, Orange County, San Diego, Ensenada and Tijuana, Baja California, San Luis Rio Colorado in Sonora and Yuma, Arizona. “The information available suggests that the fault is ready for the next big earthquake but exactly when the triggering will happen and when the earthquake will occur we cannot tell,” Fialko said. “It could be tomorrow or it could be 10 years or more from now,” he concluded in September 2005. Recent studies of past earthquake traces on both the northern San Andreas Fault and the southern Cascadia subduction zone indicate a correlation in time which may be evidence that quakes on the Cascadia subduction zone may have triggered most of the major quakes on the northern San Andreas during at least the past 3,000 years or so. The evidence also shows the rupture direction going from north to south in each of these time-correlated events. The 1906 San Francisco earthquake seems to have been a major exception to this correlation, however, as it was not preceded by a major Cascadia quake, and the rupture moved mostly from south to north. 1857 Fort Tejon earthquake: About 217 miles (349 km) were ruptured in central and southern California. Though it is known as the Fort Tejon earthquake, the epicenter is thought to have been located far to the north, just south of Parkfield. Only two deaths were reported. The magnitude was about 7.9. 1906 San Francisco earthquake: About 267 miles (430 km) were ruptured in Northern California. The epicenter was near San Francisco. At least 3000 people died in the earthquake and subsequent fires. This time the magnitude was estimated to be 7.8. 1989 Loma Prieta earthquake: About 25 miles (40 km) were ruptured (although the rupture did not reach the surface) near Santa Cruz, California, causing 63 deaths and moderate damage in certain vulnerable locations in the San Francisco Bay Area. Moment magnitude this time was about 6.9. The earthquake also postponed game 3 of the 1989 World Series at Candlestick Park. This quake occurred on October 17, 1989, at approximately 5:04 P.M. PDT. 2004 Parkfield earthquake: On September 28, 2004, at 10:15 A.M. PDT, a magnitude 6.0 earthquake struck California on the San Andreas Fault. It was felt across the state, including the San Francisco Bay Area. Ever since the 1906 San Francisco earthquake showed what the San Andreas fault can do, the public and the scientists alike have wondered: when is The Next One. Some way of predicting major earthquakes with sufficient precision to warrant taking increased precautions has long been sought, but remains elusive. Nonetheless, the 2008 Uniform California Earthquake Rupture Forecast (UCERF) has estimated that the probability of an M ≥ 6.7 earthquake within the next 30 years on the northern and southern segments of the San Andreas fault as 21% and 59%, respectively. This entry was posted in Earth Changes on 2 February, 2013 by Peacefull.